Much to the continued astonishment of the leftwing national media and the DC pundit class, Jeb Bush and Hillary Clinton, the Republican and Democratic “dynasty” candidates that were supposed to run away with their party’s 2016 presidential nominations, are fading in the early state polls. Of course it takes more than being the wife of a President to make a “dynasty,” which implies generation-to-generation continuity, so there really is no such thing as a Clinton “dynasty” unless Hillary is elected. Thus talk of the Clinton “dynasty” is really just wishful thinking on the part of the hard left feminist liberals who are Hillary Clinton’s unshakable base. Jeb Bush on the other hand is about as dynastic as you can get in American politics; grandson of a Senator, and son and brother of Presidents. Whether they truly represent a “dynasty” or not Clinton and Bush began their campaigns as the media anointed frontrunners, yet for all their advantages in money and name recognition they are both fading in the early state polls. In the CNN/Orange County Register Iowa poll Bush stands tied for sixth place with Marco Rubio and Rand Paul, behind Trump, Carson, Walker, Cruz, Fiorina and Huckabee. In New Hampshire the Boston Herald/FPU poll places Hillary Clinton behind Senator Bernie Sanders, 37% to 44%, and in no recent New Hampshire poll, even those that place her ahead of Sanders, does she hold a majority of the vote. Why are the two “dynasty” candidates fading? In our analysis it for one shared reason – their fundamental dishonesty. Hillary Clinton’s dishonesty has been manifest in a number of grotesque displays from her lies about her email, to Benghazi, to her phony southern accent when she campaigns south of the Mason-Dixon Line. You’d think after eight years of Bill Clinton in the White House Clinton lies are pretty much baked into the cake, but it is starting to look like even far-Left Democrats want the Socialist lie spoken truthfully. Jeb Bush’s dishonesty is of a slightly more subtle sort, but equally off-putting to many voters. When Bush calls amnesty for illegal aliens an “earned path to citizenship” Republican primary voters simply don’t buy the distinction between Bush’s position and the Chamber of Commerce demand for open borders to fuel their continued plundering of the American middle class. And when Bush says he was a fiscal conservative who cut taxes Republican primary voters just laugh, because they recognize that the cost of government isn’t what it taxes, it is what it spends and under Jeb Bush Florida’s state spending increased dramatically – over 50% during his eight years as Governor. 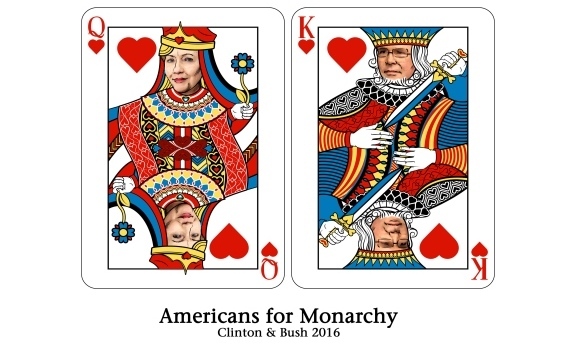 And finally, there is a characteristic that Jeb Bush and Hillary Clinton share – avarice and the use of their high positions and influence to make millions while doing little or nothing most Americans would recognize as work. After he left the Governor’s mansion Jeb Bush made over $28 million and was paid millions to sit on the board of directors of various enterprises – several of them of a dubious nature and one, InnoVida Holdings, collapsed in fraud and bankruptcy, with the company's CEO, Claudio Osorio, now serving 12½ years in prison. And despite his claim to be a “pro-life Governor” Bush sat on the Board of Bloomberg Philanthropies when it gave millions of dollars to abortion factory Planned Parenthood – an action that Bush has admitted he did not oppose. Dynasties fall, said The Wall Street Journal’s Daniel Henninger, when they fail to see the political ground shifting beneath them. Hillary Clinton and Jeb Bush are fading in the polls because the ground has shifted, and the momentum in this election is away from rule by the political class that rose during the vast growth of government that took place over the past 80 years and toward a populist majority that rejects government by a deceitful and avaricious self-selected elite. The question the election of 2016 will settle is whether the voters will choose populism on the right or populism on the left to replace the fading dynasties. Submitted by sdofaz on Fri, 08/28/2015 - 16:03. You have hit the nail on the head with this article. Change is in the future and 2016 should be an event similar to November 2014. We are learning as we go. Rinos and dems sitting now in congress still don't get the message but if they are running for reelection by the end of the elections in 2016 it should be quite clear.